If you think it's time to get a hot tub that you can enjoy with your family and friends, you probably also know that high end spas are quite expensive and may not be suitable for all budgets. In addition, high end spas are not easily portable, and if you want to enjoy yours, both outside in your garden when it's nice out and indoors when it's cold and snowing, you will need to spend quite a bit of effort to move and reinstall it. A solution to both the price and portability problem is getting an inflatable and portable hot tub. They are solidly build using 3-ply laminated reinforced material that provides comfort, support and durability. They can be inflated in a few minutes using the air-pump that is usually included in the purchase. They are are equipped with a thermostat to control the water temperature. They have built-in water filtering to make sure the water stays clean and healthy. They generate high-powered bubble jets for that pleasant massage feeling. They can be easily moved from your garden onto your deck or terrace, indoors, or even to a camping site equipped with electric outlet and some water source. They cost a fraction of high end spas. Warning 1: Note that if you want to install a portable spa on your deck or terrace, you should first evaluate if the deck or terrace will be able to carry the tub full of water and with people. It really depends on the integrity of your deck and how it was built. Warning 2: Note also that these portable inflatable tubs are not supposed to be used outside when it’s colder than 40 degrees Fahrenheit as the material the tub is made of could become brittle and susceptible to breakage when exposed to temperatures lower than 40 degrees Fahrenheit. 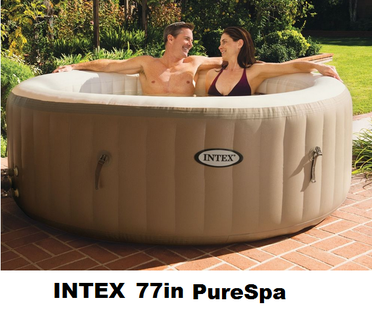 This article will compare Intex 77in PureSpa, Bestway Lay-Z-Spa Miami and Coleman Lay-Z-Spa portable and inflatable hot tubs (spas). These were not just the most popular among Amazon customers at the time this article was written, but they had also received excellent reviews from most Amazon customers (an average of at least 4 stars each out of 5 stars!). 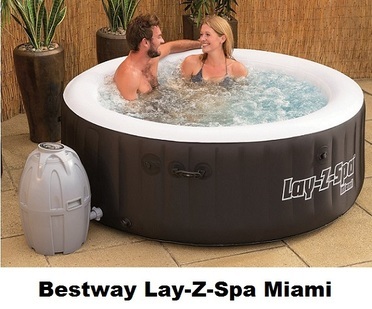 Note that Bestway Lay-Z-Spa and Coleman Lay-Z-Spa are also referred to as Bestway SaluSpa and Coleman SaluSpa. The bottom of all three spas is cushioned, so you can sit comfortably straight on the bottom. When seated, the water reaches about chest high with enough room for legs to straighten out. 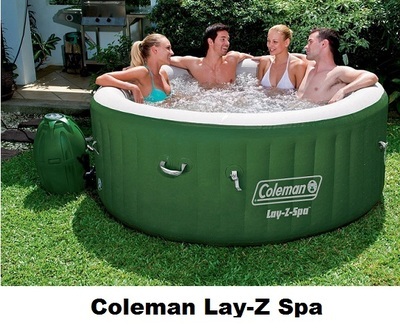 Note that even though the product specification for the Coleman Lay-Z spa says that the tub can accommodate up to 6 people, many customers who have bought this tub have reported that 6 people can fit very tightly, and that quite a bit of the water will be displaced and overflow out of the tub; and in particular, if bubbles are utilized, overflow will happen very quickly. Therefore, we believe that the maximum number of people that can sit comfortably in all three tubs is 4. To inflate these spas you use the combined heater/air-pump unit that is provided. Bestway and Coleman spas use the same exact heater/air-pump unit shown in the picture below. The unit used by the Intex spa is different and also shown below. Note that these same heater/air-pump units are also used to agitate the water and generate high-powered bubbles jets. It takes no more than 5 minutes to inflate these spas. All three spas considered here are made of puncture-resistant 3-ply laminated reinforced material that provides comfort, support and durability. The material consists of a polyester mesh core, encased in two layers of laminated PVC. In addition, the walls of these spas incorporate what is known as I-Beam construction that allows users to sit and lean against the sides without the spa bending or buckling. All three spas considered here come with a cover that locks down and preserves water’s temperature when the tub isn’t in use. It also keeps dirt and debris out. The filters need to be changed on a regular basis; however, the time between changes depends on how the tub is used. Clearly, if the tub is placed somewhere prone to receive lots of dirt and debris, if it is used for longer periods of time, and if people do not shower prior to using the tub, then the filters will have to be replaced more often. You should use the provided water testers to determine if the filters need to be changed. Note that if you don’t want to replace the filters often, you can also rinse, clean and reuse them for a limited number of times. But, you should test the water with the water testers to see of rinsing and cleaning the filters was sufficient to have clean water. Water quality testers and as well as a chlorine/bromine floater are included with each of these three tubs. You insert chlorine or bromine tablets into the floater which slowly dispenses the chemicals into the water to keep it fresh and clean at all times. The control panel of all three spas considered here allow you activate the 120 high-powered bubble jets surrounding the interior of the spa for a refreshing massage. Bestway and Coleman spas come with a 1 year warranty for the heater/air-pump unit and 6 months warranty for the spa liner. The Amazon prices shown were in effect at the time this article was written and may have changed. For exact prices, please refer to the Amazon products section below. Note that the Amazon price often includes a generous discount on the list price. If a discount exists, both the Amazon price and the list price will be displayed when you click the Amazon product link images below. So, which of the three spas to buy? When you look at the comparison table above, it soon becomes clear that all three portable tubs considered here are solidly built using the same 3-Ply lamination and I-Beam technologies and provide similar features. Note that at the time this article was written, all three had received excellent reviews and an average rating of at least 4 stars out 5 stars! In terms of the space they offer, as mentioned in Note 1 above, though the Coleman spa product specification claims that it can accommodate 6 people, that would not be a comfortable situation, and the tub should really used by at most 4 people. So, even space-wise the four tubs are quite equivalent. One difference to note is that the Intex tub is the only one that comes with a carry bag. So for most buyers, the selection becomes then simply a matter of choosing between different colors, aesthetics and prices. 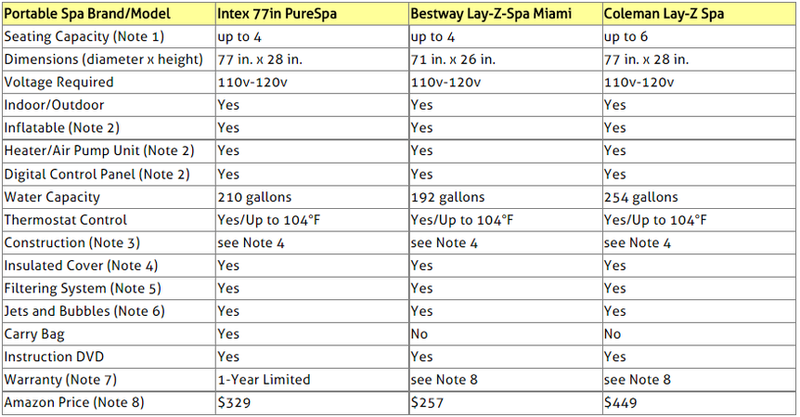 When this article was written, Bestway Lay-Z-Spa Miami was the lowest priced, and you might want to consider it as your first choice, unless prices have changed since .